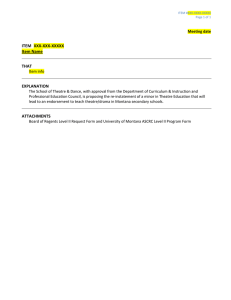 Crotty, Kelly, "From Start to Strike: A Lesson Plan for the Whole Theatre Experience" (2011). Outstanding Honors Theses. Paper 10. What field is your degree in? When did you first become interested in drama/theatre? my mother and aunt took me to see A Chorus Line on Broadway. EV: Took my first Drama class in Middle School and was instantly hooked. would have affected your life? on a production and creating the “Family” that is needed among the cast, crew, and production staff. community that comes with being a part of the arts. English—my second passion in life. had affected me. My favorite thing in the world was Musical Theatre, so it just made sense. What age level do you teach? Why this age level? Would you prefer a different age? great place to build a fire and create a passion. kind of like the idea of being the kind of teacher I want her to have. At the end of the day, I prefer High School and will probably return before long. In your opinion, what is the purpose of drama in a high school setting? and an appreciation for the arts and to lay the ground work for lifelong enjoyment and or participation. TRULY gifted students to find their calling. 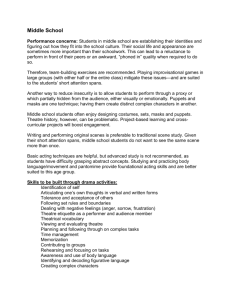 What benefits do you feel drama classes provide for students in high school? come in and feel safe to be themselves and know that they will not be judged for being themselves. budget, art (graphic, visual and performing), and so many other disciplines. 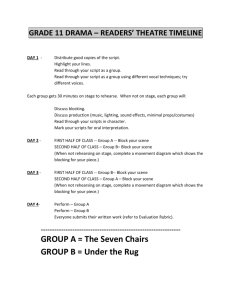 How do you structure your drama classes? boundaries be loosened progressively so that the only chaos that ever ensues is planned and controlled. developing artists to be mentored and nurtured more that "instructed." What determines the plays you perform? favorites also have a huge impact on what I choose to direct. envelope (which I believe in doing often), it must be for a real, defendable, discussable, artistic purpose. arts and we can." There are THOUSANDS UPON THOUSANDS of choices you can make, why this one? class do and do well? AND PASSIONATE AND THEY WILL COME. Do you find it challenging to get students interested in participating? rehearsal schedule and coming to the performances. What do you hope students gain from your class? process, from lead actor, to director, to technical crew to audience member. Lifelong friendships and memories. This is a discipline that feeds the heart and soul as much as the mind. the years. I hope to be remembered that way by my students. to see what it really takes to produce a play first hand. process in ONE class is nearly impossible. wine tasting... a sip of each flavor, not a bottle or a glass. Do you think it’s feasible for high school students? 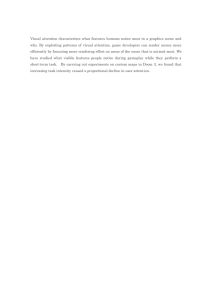 What problems do you foresee in a class such as that? the main problem for all of the arts courses in certain counties. What are your favorite improv games? stifled creativity in a positive manner. the part of everyone on the team, more so from those already on the stage than from the one joining. Do you mind if I contact you for additional information and input as I continue my project? JT: YOU MAY CONTACT ME AT ANY TIME! dramatic forms (e.g., theatre, film, and television). forms and production practices are used to discover symbolic clues in dramatic texts. (e.g., different depictions of the story of Aladdin). (e.g., auditioning, directing, producing, and scheduling) for various media (e.g., theatre, film, television, and electronic media). complement the interpretation of a text. aspects of theatre production to safely create properties, sound, costumes, and makeup. 3. designs, implements, and integrates all sound effects into the production concept. 4. understands all technical elements used to influence the meaning of the drama. 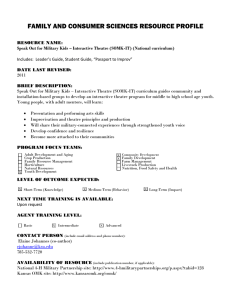 1. understands how to use various arts media to enhance communication in theatrical productions. 4. understands the necessity of goal-setting, self-discipline, punctuality, meeting deadlines, and fulfilling responsibilities when mounting a theatrical production. 5. recognizes the significant works and major contributions of major playwrights, performers, designers, directors, and producers in American theatre. processes of the subject matter. "Course Descriptions." Florida Department of Education. Web. 1 Oct. 2010.
reflect appropriate Sunshine State Standards benchmarks. performances, and production responsibilities beyond the school day. Adaptation of Instructional Materials in section 1006.34(b)(2), Florida Statutes. benchmarks from the Sunshine State Standards that are most relevant to this course. addressed in the Sunshine State Standards. as well as the period, style, and culture of the production. dimensions of characters from various genres and media. 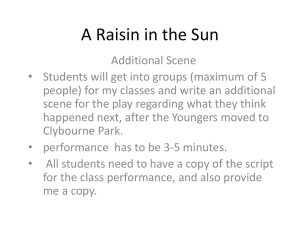 dialogue and stage directions that convey the playwright’s intent. media (e.g., different depictions of the story of Aladdin). Greek tragedy, and Japanese Noh). period of dramatic literature to be performed. TH.D.1.4.2 understand allegoric and symbolic references in plays. Demonstrate use of advanced movement and vocal production techniques. style, and setting of a production. designers, and/or directors with the final artistic product. properties, costumes, make-up, lighting, sound, and set). and craft of the producer, designer, manager, and crew members. theatre, film, television, and electronic media). required to participate in theatre productions. when mounting a theatrical production. contributions, responsibilities, and craft of the director. Demonstrate understanding of the auditioning and casting process. (i.e., leadership team, chain of command, and job-specific responsibilities). 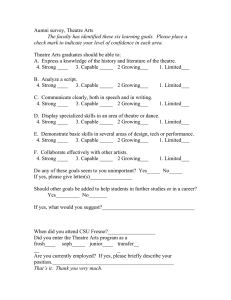 Identify opportunities and requirements for a career in theatre arts. the process. Where students can be introspective, and focus on themselves, while creating a work of art. o 15th- Read- thru/ discussion. o 16th – Performance in class & evening. 2. Hand out Syllabus & give brief overview. 3. Give students 5 minutes to review syllabus for game. 1. Q & A Game. 2. Allow for questions about the class. 3. Allow for questions about the game. 2. Making Inquiries- introduction game. Students will understand the structure of the class. Become familiar with each other. Allow students to become comfortable working with each other. As well as introduced to basic improv/performance techniques.  Who has taken drama before?  Been in a play? Favorite play? What will be we doing in class? The name of the play we’ll work on? The name of the book we’ll read? This rather complicated game is particularly useful with a new class who do not know each other very well. The class divides into pairs and each pair decides who is 'A' and who is 'B'. To begin with, A has to find out as much as he can about B in 2 minutes. At the end of that time, the As stay where they are and the Bs change partners. The class are then told that B is a policeman who is suspicious of A and intends to question him. Repeat the game with new partners (and with A’s becoming B’s). The class divides into pairs and decide on who is 'A' and who is 'B'. partially but not completely (e.g. : Now A is old and deaf; or, now B is a rich and famous person). The class sits in a circle and the teacher asks for a volunteer to start the game. (e.g. : building a house; shopping at a supermarket). The volunteer begins the mime he has thought of. using the location he has chosen. The teacher's aim is to get as many people in the class involved as he can, and in as short as time as possible. different locations are called out, students will travel to that location. and locations for different parts of a theatre. Explain terms & locations of different parts of a theatre. counters, concessions and restrooms are all usually located in the lobby. o Box Office: Where tickets are sold to the public. performers preparing to enter, storage of sets for slow changes and as a stagehand work area. Wings also hide technical equipment, such as lights which project from the side of the stage. o Dressing Room: Rooms where cast members apply wigs, make-up and change into costumes. in when they are not needed onstage or in their dressing rooms. followspots, lighting and sound boards, and is sometimes the location of the stage manager's station. light leak or noise), and is generally an enclosed space. such as lighting and sound, may be manipulated. goes towards the rear of the house.  Down Stage: The area of the stage closest to the audience.  Stage Right: The area of the stage to the performer's right, when facing downstage (i.e. the audience).  Upstage Left: The area of the stage furthest from the audience. and also increases the available acting area above. the responsibilities/ duties associated with each. level of understanding for the roles within a production. 2. Students will be asked for answer as the roles are identified. Publicity- responsible for advertising and promotion of the production. on supporting the technical departments. communication with the following departments. with headset communication to the Stage Manager. and strive to fulfill the pacing and tempo decisions of the director. audience a sense of where the action of the play is taking place. Set Designer. Team members consult with the Set Designer to complete the working set. of the Set Designer. Decorating requires a unique set of artistic skills. or creating the sounds necessary for the play. research and knowledge of the measurements of each actor. play based on the script and the Director’s interpretation. the actors. Makeup must be inventoried and purchased within a set budget for any production. changes. They follow the direction of the Assistant Stage Manager. Light Crew follow their cues as “called” by the Stage Manager during the show. and cleanliness of the seating area. arrival, seating, and dispersal of audience. communicate their needs to the various departments. implied; giving the audience a sense of where the action of the play is taking place. Designer. Decorating requires a unique set of artistic skills. and setting up the Public Address system and monitoring speakers for the production. extensive research and knowledge of the measurements of each actor. necessary props for the production. determine stage blocking. They need to communicate their needs to the various departments. may specialize in any of the production areas. sense of where the action of the play is taking place. set has met the approval of the Director. requires a unique set of artistic skills. ___ Works with the director to establish the lighting “look” for each scene and transitional lighting. to meet the design specifications developed by the Technical Director. knowledge of the measurements of each actor. Director’s interpretation. Props are given final approval by the Director. direction of the Assistant Stage Manager. ___ responsible for the sale of tickets and in coordination with the House Manager the organization of seating. Students will learn about the process of a production, step-by-step. semester when we begin working with Tuesdays With Morrie. process by which a theatrical production comes together. to create a complete production timeline. 1. Class discussion, opportunities to hypothesize which step is next. 2. 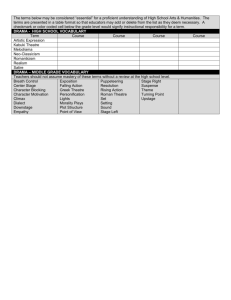 Ordering worksheet for the steps of a production. Allow students to give ideas for the steps. be on Theatre and what its purpose was during each time period. 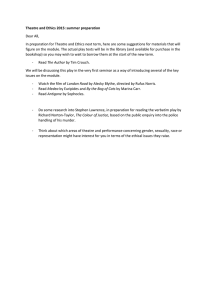 Give students a background for the history of theatre. theatre was during certain time periods. 1. Allow students to ask questions about information. o 534 B.C--- Greek God Dionysus.  Italy- first steps taken toward the development of the proscenium or “picture frame” stage.  Technological Advances: Musicals into Films---Hollywood competes with Broadway. used to influence the meaning of the drama. To teach students the characteristics of different types of theatres. What they are best suited for and differences between them. 1. Discuss types of shows that would fit in each theatre. A proscenium theatre is what we usually think of as a "theatre". playing area of an end stage. area, usually raised, surrounded by raked seating. not fixed. Instead, each can be altered. Often used in "found space" theatres. compare discuss after reading play.  Students will discuss the books. Their thoughts, feelings reactions.  Certain scenes will be selected for students to improv. 2. Hypothesize the differences that will come about when in a play form. What was unique about the setting of the book? What specific themes did the author emphasize throughout the novel? What do you think he or she is trying to get across to the reader? Can you relate to the characters? How do characters change or evolve throughout the course of the story? Has the book changed your opinions on teachers, life, or death? class will participate in a read-thru of Tuesdays with Morrie. 1. The process of a read-thru will be explained and experienced. read-thru. A discussion will follow the read-thru.  What is your initial reaction to the play?  What else have you learned about Mitch’s character?  What do you think would be the best type of stage to use?  What are some important themes you can see in the play?  Does approaching death automatically make one’s voice heard where is wasn’t before? Do you think Mitch would have listened if Morrie wasn’t dying?  Mitch had a list of topic that he wanted Morrie’s insight on, what would your list include?  Mitch always arrived at Morrie’s house with food. Discuss the importance of this tradition.  What do you think of Morrie’s theory you have to understand dying before you can understand living? want to go forward." Have you experienced this in any ways? them analyze difference in the novel and play Tuesdays with Morrie. the book and play TWM. 1. Discussion about qualities of books and plays. 3. Ask for discrepancies in the book and play.  Did you like the play or the book better?  Differences from play and book?  What stayed the same?  Is there anything that happened in the book you missed in the play or vice-versa?  What changes would you make to the play?  Which do you feel gives a more accurate portrayal of Mitch and Morrie? Why? the author’s lifestyle/experiences, and the social status of the play. class will be used to discuss and share the information found. and gain experience in researching for productions. 1. Brief recap of a dramaturg’s responsibilities. 4. Class will reconnect to discuss answers found. 1. Students will have time in the library to research their questions. 2. The class will have a discussion about what information they found. 1. What time period did the play take place in? a. What are some key characteristics of that time period? 2. What kind of clothing did men typically wear? a. What hair styles were popular? a. What are some key characteristics of the disease? 4. Where is the play set? 5. When (time of year) does the play take place? 6. What are the typical weather conditions for that time of year? 7. What is the lifestyle of a newspaper columnist? a. Do they travel a lot? b. Have a lot of free time? c. Do they work long hours with a lot of late nights? d. Is their schedule pretty routine, or does it change day-to-day? Research any other aspects of the play or book that appeal to you. Be prepare to share your findings. 3. Class will reunite to discuss the scenes they came up with. Breaking into groups, each group will have a section of the play to break in to scenes. Scene 1: Page 9- Mitch: He could’ve danced forever. Scene 5: Page 16-19; Morrie: living unhappily is something else. Scene 6: page 19-20; Mitch: He was seventy-eight and dying. Scene 7: Page: 20-24; Mithc: …I was, the next Tuesday with my homework and some good…annnnnd…. Scene 8: Page 24-29; Mitch: …and my list of questions is getting shorter. Scene 9: page 29- 31; Mitch: I said it was theoretical, all right? Scene 10: Page 31-32; Morrie: We must love one another or die. Scene 11: Page 32- 36; Morrie: She’s coming next Tuesday. Scene 12: Page 36-36; Mitch: They’ll know you’re a fraud. Scene 13: Page 36-38; Janine’s Voice: The very thought of you, my love. Scene 15: Page 41- END. Mitch: He could’ve danced forever. Morrie….. Mitchell Albom. My old friend has come back. Morrie: living unhappily is something else. Mitch: He was seventy-eight and dying. Mitch: … with my homework and some good…annnnnd…. Mitch: …and my list of questions is getting shorter. Mitch: I said it was theoretical, all right? Morrie: We must love one another or die. Morrie: She’s coming next Tuesday. Mitch: They’ll know you’re a fraud. Janine’s Voice: The very thought of you, my love. class will walk through the process of creating one. Understand the purpose of a rehearsal schedule. Understand the process of creating a rehearsal schedule. 21st thru the performances on December 17th. 1. Discuss the process & purpose of creating a rehearsal schedule. 2. Create a rehearsal schedule for TWM. Usually the SM will work with the director to create a rehearsal schedule. Consider the length of your show, longer shows will require a longer rehearsal period. rehearsal, or tech period, will need to be. available. The more specific their availability, they more accurate your schedule can be. Make note of the days/times that are similar among your cast, use these as your rehearsal dates. intend to rehearse. Be sure the names of the actors needed for each day are clearly listed. Save your rehearsal schedule and hand it out to cast and crew. theatre, film, television, and electronic media. 2. How to analyze a script—what to ask. Read script: again and again [and again, and again]. 1. Setting- Where does the story take place? 2. Time- When does it take place? 3. Plot- What is the story about? 4. Theme- What message is being sent? 5. History-What background information is given? 6. What problem is trying to be solved? 7. What can the audience most connect to? 8. What is the outcome? 9. Protagonist- Who pushed the story along? 10. Antagonist- Who tries to stop the efforts of the protagonist? Script analysis is a continual process. Each time you read the script, you should discover something new. script. The class will begin analyzing TWM. 1. Review script analysis information from previous class. the script analysis process, as well as the play. What information do we discover? What are the main points that move the story along? What does the story change direction/theme/meaning/? What is the climax of the scene?  What do we learn about Mitch in this monologue?  What do we learn about Morrie?  What do the different dances indicate?  What is “Shana cup”?  What does “farhaltisht deine licht unter a shorten” mean?  What background information are we given?  Why doesn’t Mitch call Morrie “Coach”?  What do we learn about Mitch’s lifestyle?  Why is Mitch looking for his car keys?  What does Morrie think about journalists?  Why does Morrie tell Mitch about the way he will die? understand the script analysis process, as well as the play.  Why are there voiceovers in this scene?  What is their significance?  What about the tennis pocks?  What does Morrie’s living funeral tell us about him?  How do you interpret the words the playwright has written using all capital letters?  What are their differing views on males crying? Why?  Morrie asks a lot of questions about death. Why? What questions about you ask?  What’s learned about love?  Morrie says Mitch’s words “hurt”, what bearing does this have on their relationship? Their views?  What does “There is no ‘point’ in loving; loving is the point” mean?  Where does this come from?  Why is it said now, only to the audience?  What does Morrie mean by it?  Mitch brings food again, why?  What most affects Morrie in this scene?  Why does Mitch bring up the story of Job?  Did God overdo it? What was the result of Job’s story?  What does this monologue show us?  Why is it important?  How does Janine meeting Morrie effect Morrie’s perception of Mitch? Does it?  How does Janine’s voice affect Morrie?  What if Mitch hadn’t thrown away all his mail from Brandeis? Would he have seen Morrie sooner?  What is Morrie’s biggest lesson in this scene? Why does he speak of love and forgiveness so much?  Where does “don’t hide your light under a bushel” come from? What was Morrie’s priority in life? How did this realization affect Mitch’s life? Was that Morrie’s lesson all along? Physical warm-up: stretch, cardio, peel-peel-banana, you do what I do. Think of a sad moment. What was around you at that time? Think of a happy moment. Who was there? What made it happy? count of three shout it out. Trust – Demonstrate the importance of trusting other actors while onstage. Trust walk, trust fall. examples of good and bad criticism. ***Regardless criticism need not be taken personally. -Freedom - Actors must be able to be anything, at a moments notice. Animal characterizations, elderly, funny, sad, etc. B: It’s the best thing. Learn how to analyze a character, what to look for. collaborating on a character analysis. They will further their character analysis skills. Q & A Session about Mitch. 1. Complete a character analysis of Mitch. 3. Questions/debate/ search for more in-depth answers. up? What does he eat for breakfast, lunch, dinner? Does he read books, watch TV, play sports, etc. Questions/debate/ search for more in-depth answers. rehearsals for formal and informal productions. 2. Scene 1 will be used as an example. -Working through the scenes connecting the lines in the script to movements on stage. -Usually a tedious, slow and repetitive process. -Typically blocking is given by the directed. Sometimes, the actors are self-directed. -Clues for movement ideas can come from textual clue. -Blocking can be very useful in creating stage-pictures that connect directly to the purpose of the play. directions that convey the playwright’s intent. that convey the playwright’s intent. 2. Students will convey the blocking they created to the actors. 3. Blocking of Scene 10.
theatre production to safely create costumes. 2. The class will design costumes for Mitch & Morrie in TWM. Costumes can be made, bought, adjusted from other costumes. The costumes should reflect the traits of the characters. mesh with the entire production concept. o Take note & make quick changes possible. designers’ role, and the importance of a set within a production. They will gain hands on experience by designing the set for TWM. 2. The class will design the set for TWM. Scenic designers are responsible for the scenery, furniture and props within a production. It should give the audience information about the director’s concept. What should the set do? theatre production to safely create lights. 2. The class will design lights for TWM. Lighting designers use light to create effects that will match the mood and setting of the production. o Basic purpose: allow the actors to be seen by the audience. the interpretation of a text. music, levels, and sound effects have on a play. 2. The class will design sound for TWM. Sound designer is responsible for creating the sounds effects in a production. o Sound plot: list of all the music and sound cues for each scene/act. production. Review the designs for TWM and discuss any changes. 2. Prepare Cue-to-Cue for TWM with actors, SM and designers. The students will see all the pieces of the production come together. 2. Notes for designers, actors, SM, etc. 2. After school and evening performances. performance and film versions of TWM. 2. Next class: Discuss the differences between the film, play and book. Students will observe the differences in films, books, and plays. both in performance and in objectives. 2. Discuss the differences between the film, play and book. What is lost from the book or play in the movie? Is there anything that is gained or emphasized? Did you realize anything new about Mitch, Morrie or the story in general? How did you feel about finally seeing Janine? How does Mitch/Morris differ from the way you viewed them? Do you think that happens in life, people see you differently than you are? Have you had a teacher like Morrie? Mitch’s list included things like love, work, aging, etc. What would your list include? semester both academically and personally. will be encourages to give constructive criticism. 2. Review sheet for final exam. Libraries. UW Libraries. Web. 15 Nov. 2010. <http://www.lib.washington.edu/drama/dconcept.html>. "Creating a Course Syllabus." Afbh.uaa.alaska.edu - /. Web. 7 Mar. 2011. How To Videos & Articles | EHow.com. Web. 1 Dec. 2010. "Collection of Drama Lessons." Fantastic Plays for Kids. Web. 5 Dec. 2010. "Curriculum and Instruction." FLDOE Home. Web. 1 Oct. 2010. "Definition: Script Analysis." Acting Magazine | Acting Info and Casting Auditions for Actors. Web. 13 Dec. 2010. "File:Stage Layout Plan.jpg." Wikipedia, the Free Encyclopedia. Web. 9 Nov. 2010. Hendrickson, Natalie. "DramaOneNotesExercises." High School Drama. Web. 8 Nov. 2010. Lee, Hsien-Hui. "The Stages." Theory of Scenographic Design. Web. 15 Nov. 2010. Marshall, Peter D. "Script Breakdown - Character Analysis - Free Article Courtesy of ArticleCity.com." Articles to Our Articles Directory. Web. 13 Dec. 2010. Marshall, Peter D. "Script Breakdown - Script and Scene Analysis - Free Article Courtesy of ArticleCity.com." Articles to Our Articles Directory. ArticleCity. Web. 29 Nov. 2010. "The Production Process." Upload & Share PowerPoint Presentations and Documents. Web. 8 Nov. 2010. "Since Will." Tupelo Community Theatre. Web. 10 Nov. 2010. <http://www.tctwebstage.com/sincewill.htm>. "Theatre Arts 20 Module 1.1 Theatre Roles." Saskatchewan Schools and School Divisions. 18 Jan. 2005. Web. 5 Nov.
"Theatre Spaces Part 3." SUNY Geneseo | SUNY Geneseo. Web. 15 Nov. 2010. Thompson, James. "Thesis Interview." E-mail interview. 01 Nov. 2010. "Tuesdays With Morrie." Random House - Bringing You the Best in Fiction, Nonfiction, and Children's Books. Random House. Web. 22 Nov. 2010. <http://www.randomhouse.com/features/morrie/guide.html>. Velazquez, Edwin S. "Thesis Interview." E-mail interview. 01 Nov. 2010.